Oceanside Grandmothers come from the east coast of Vancouver Island, BC, Canada, from the region that includes Parksville, Qualicum Beach and several other seaside communities between Nanaimo to the south and Courtenay to the north. 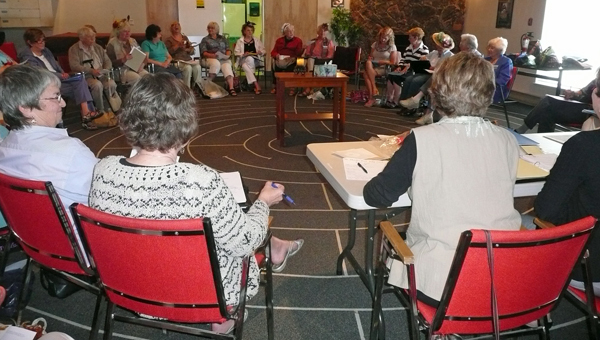 Currently, approximately 130 women aged 45 to 90 are part of our local group. Our structure is clear but flexible to enable our personal engagements to mesh with the other commitments of our lives. We meet six times a year (January, April, June, September, October, and November, on the third Tuesday of each of these months) in the hall of Knox United Church to review and celebrate past projects and to plan new ones. Outside of meeting time, we are active within committees that create or plan projects, and in the numerous events that raise awareness and funds. We work cooperatively and cheerfully. We are conscious of the seriousness of our purpose in giving support to our African counterparts, but we work with a smile. We enjoy creating products to sell, running events for the Oceanside region, and having fun together. Anyone interested in joining our group is welcome to attend our meetings, whose dates are indicated on the calendar under Upcoming Events listed in the menu bar at the top of this page. If you have questions, see Contact us.